Hello everybody! Happy Lunar New Year! I finally came back from my trip to Taiwan last week, and I did not miss any coldness in NY! I hope you all survived from the freezing air. 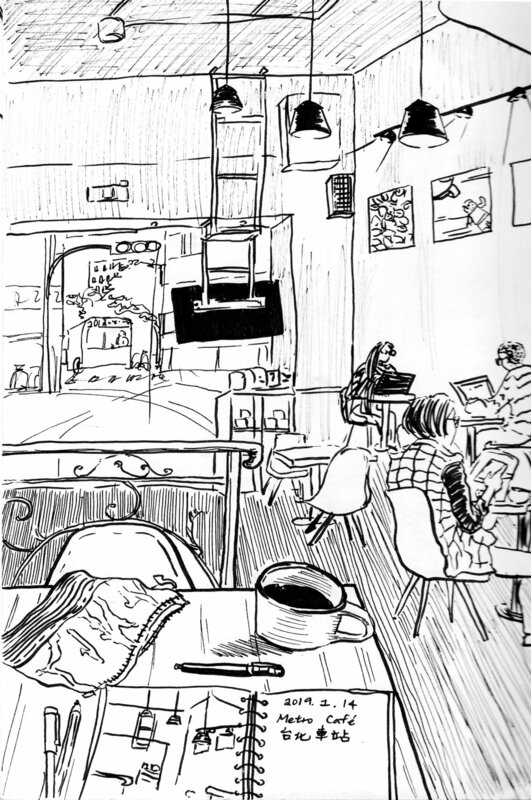 It’s good to reconnect with my family and friends after a year and a half and do some urban sketching here and there, so I would like to share some of them with you today! A cafe across my house with cats walking around in there. It had become one of my usual spots in Taipei when I go back. I tend to avoid going there on weekends for the crowds of cat lovers, but on weekdays it’s a quiet place to do your own work. 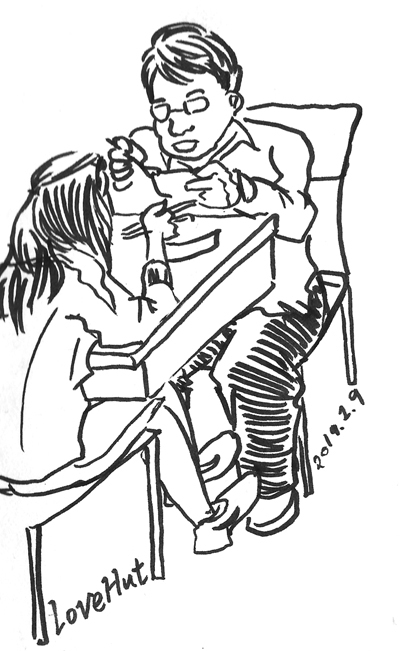 This is a quick sketch of a couple I did while waiting for my friend at Loving Hut, a whole vegetarian restaurant. Eslite Cafe is located inside of Eslite bookstore, which is like a Taiwanese version of Barnes and Noble but even better! I’m often amazed by the art designs and stationary over there. What’s the best is the Dunnan location is 24-hour. If you’re a sleepless artist, Eslite bookstore is your savior. 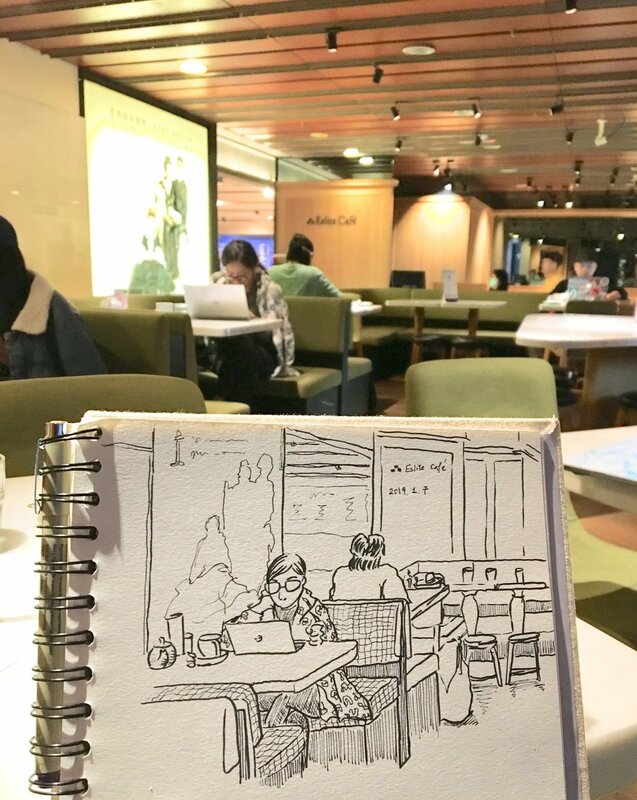 I stumbled into Metro Cafe while waiting for a friend at Taipei Main Station. Their sandwich is pretty good. The bread is softer unlike baguette sandwich which hurts inside of my upper mouth. The trip had reconfirmed my praise to Taiwan —the great customer service, the high-efficiency at government bureaus and the convenience in transportation. It’s no cliché by seeing different worlds, you’d appreciate more of what you have.